The scars left over from leaves that have fallen off. 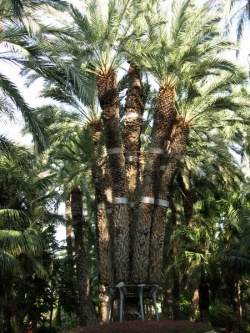 Palms have a particularly unique root system. Unlike most trees whose roots branch out underground, these generally do not. They have a numerous root system that stay bunched together at the base of the tree stem. As usuall most of the roots are located in the soil underneath the plant, but as it gets older new roots are formed. Some of these new roots sometimes begin to grow above the soil as either a stilt or prop roots. In many of those located in rainforests, the roots are near the surface and not deep underground. They are found beneath the humus on the forest floor. Those living in open forests or habitats with seasonal rainfall have roots that go down deep in order to anchor the plant well and find sufficient water supplies. Palm flowers come in a vast array of appearances. They are small, sessile (having no stalk) or peduncular, and can be either solitary or clustered together. Usually they are inconspicuous and do not catch one's attention right away. Their color is generally a yellow-green shade. The female is more noticeable than the smaller sized male. There is also a large gap in numbers with males overpopulating the females. In this flower, there are 6 stamen that are grouped together in two separate whorls, 3 stamen in each whorl, each with biloculate anthers. There is also an ovary with 3 carpels, or 3 connate carpels. These flowers are either unisexual or bisexual. There are 3 sexual forms of which palms will take that is monoecious, dioecious, or polygamous. Monoecious is when the male and female flowers are found on the same inflorescence or separated but still on the same plant. Dioecious is when male flowers and female flowers are on individual inflorescences that are on 2 different plants. Polygamous is when bisexual and unisexual flowers are combined in various ways on the same inflorescence. When unisexual flowers are not present, the group will be hermaphroditic and have bisexual flowers. 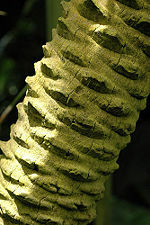 Copernicia alba. A South American species. Introduction to Palms Keith Boyer. 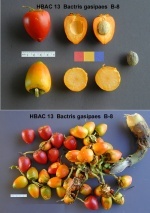 Extracted from "Palms and Cycads Beyond the Tropics". PACSOA. The Palms Anna Guglielmo, Pietro Pavone, and Cristina Salmeri. PACSOA. Palm (plant) MSN Encarta Online Encyclopedia. This page was last modified on 9 June 2015, at 11:18.